Mix all ingredients with enough water to get a soft dough (consistency same as pizza or chapathi dough). Knead well. 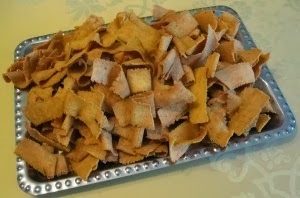 Fill a cookie press or a chakli press with ribbon mould and press the dough directly into the oil. Cook until lightly browned, turning once. Transfer to a plate lined with paper towel, to absorb the excess oil. Cool completely and then store in an air tight container.